This article on the Royal Horse Guards (The Blues) during the First World War will provide you with an overview of the Royal Horse Guards (The Blues) during the First World War. In addition, it will enable you to research both officers and other ranks who served with the Regiment during the war. The Royal Horse Guards was stationed at Windsor when Britain declared war on Germany on 4 August 1914. The cavalry initially sent one squadron abroad along with a squadron from the 1st and 2nd Life Guards as part of the Household Cavalry Composite Regiment which landed at Havre, France on 16 August. The rest of the Royal Horse Guards landed at Zeebrugge and Ostend, Belgium on 8 October 1914 as part of the 7th Cavalry Brigade, 3rd Cavalry Division. The Regiment was transferred to the 8th Cavalry Brigade, 3rd Cavalry Division on 21 November 1914. The Regiment served with this Brigade and Division until 7 November 1917 when it was transferred back to the 7th Cavalry Brigade, 3rd Cavalry Division. In March 1918, the Royal Horse Guards was converted into the No.3 (Royal Horse Guards) Battalion, Guards Machine Gun Regiment. The Royal Horse Guards only served on the Western Front for the duration of the war and if you would like to find out more information about the Regiment I’d recommend downloading the war diaries which I have discussed below. 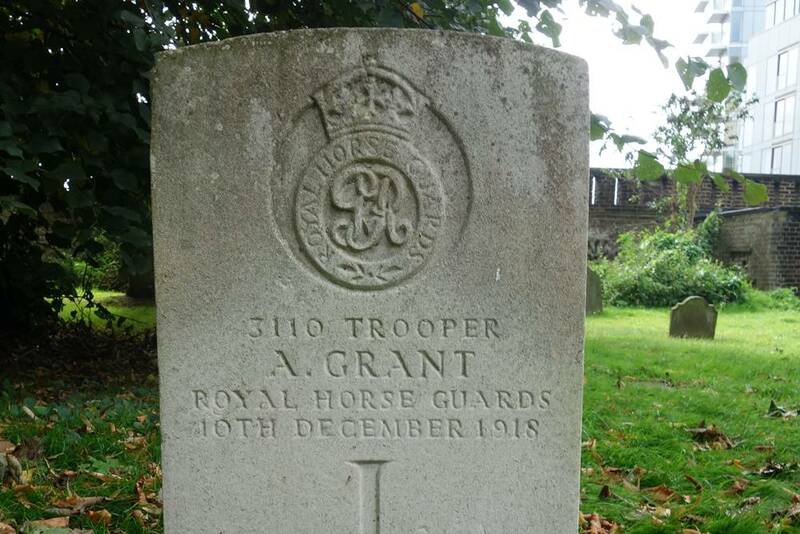 The headstone of Trooper Alexander Grant, Royal Horse Guards who is buried in Brompton Cemetery, London. As most soldiers who served in the Royal Horse Guards have surviving service records they tend to be easy to research and Alexander is no exception. Alexander joined the Regiment in November 1902 and was a reservist when war broke out. He was just over six foot, a great height for a working class man of this period and the Household Cavalry recruited the tallest men it could find. 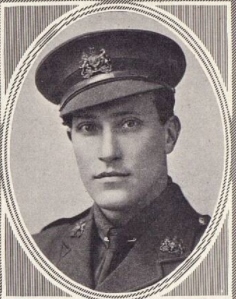 Alexander rejoined the Regiment in August 1914 and served in Britain until May 1918 when he was sent to France. In France, Alexander caught influenza and was invalided back to Britain where he died with his wife by his side at 3rd London General Hospital on 10 December 1918. A service record is going to be the key document to find. The service records for the Royal Horse Guards weren’t stored in the War Office warehouse which caught fire during the Blitz and most have survived. 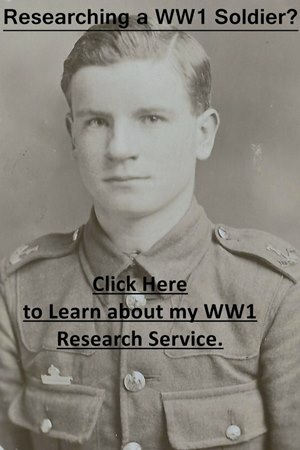 You can also look through my generic Guides to Researching First World War Soldiers. The pages on medal records, abbreviations and acronyms and using newspaper reports are especially useful. I’d also recommend downloading the relevant war diaries which I have discussed below. Officers: There are over sixty service records for officers who served with the Royal Horse Guards at the National Archives and I offer a copying service for these records. Other service records may be held at the Household Cavalry Museum Archive and you will have to apply for a copy. The war diaries of the Regiment (see below) should be downloaded as officers are mentioned throughout and a newspaper search is always worthwhile. Officers are recorded in The Story of the Household Cavalry: Volume 3 (see below) but this book hasn’t been reprinted and is difficult to find. Portrait of Second Lieutenant William Lawrence Breese Royal Horse Guards who was killed in action on 14 March 1915. This photograph was taken from Tatler which is an excellent resource to search if you’re after a photograph of an officer who served in the Household Cavalry. At the National Archives if a soldier was discharged from the Royal Horse Guards between 1799 and 1920. The catalogue reference is WO 400 and they can be searched and downloaded for a small fee by clicking this link: Search Royal Horse Guards Service Records. Or you can view them on FindmyPast which has a free trial. At the Household Cavalry Museum Archive which holds Royal Horse Guards service records for those who served after 1920. The archive charges a fee of £25 and I’d highly recommend applying for the service record as it will contain information you will not be able to find elsewhere. The service records in the WO 400 series are available on FindmyPast which has a free trial. Clicking on the banner below will take you to the website. You’ll need to use both FindmyPast and Ancestry if you want to research a soldier who served in the First World War. There are two war diaries for the Royal Horse Guards and one war diary for the Royal Horse Guards Machine Gun Battalion. All the war diaries have been digitized by the National Archives and you can download them for a small fee by clicking on the blue links below. I have transcribed some entries at the bottom of this page. Notes: A very good war diary, not so much for its daily entries but that each month has an appendix recording all the Regiment’s casualties with a soldier’s name, rank and the date of the casualty recorded. There are a large number of special order of the day as appendices. Notes: An average war diary, though there are still casualty appendices appearing at the end of some months though very little occurred during this period. There are a large number of special order of the day as appendices. There is also a very interesting report of a “Conference held in the Secretary of State’s Room, War Office, on March 4th 1918” regarding the formation of machine gun battalions from the Life Guards and Royal Horse Guards and associated correspondence. Notes: This war diary has been digitized and is available to download from the National Archives’ website. There was no regimental history produced for the Royal Horse Guards concerning its role during the First World War. However, the Regiment is covered in The Story of the Household Cavalry: Volume 3 by Sir George Arthur, Bart., assisted by Capt. Shennan Royal Horse Guards. This volume hasn’t been reprinted and can be quite difficult to obtain. I viewed a copy at the British Library. The Imperial War Museum holds a 26-page photocopy of a diary kept by A. Badger who served with the Regiment on the Western Font between June and August 1918: Documents.16066. If you are researching a soldier who served in the Royal Horse Guards during the First World War have a look at my articles: Guides to Researching British Soldiers. A good book to give context regarding the role of British cavalry on the Western Front is Horsemen in No Man’s Land: British Cavalry and Trench Warfare 1914-1918 by David Kenyon. Are you researching a soldier who served in the Royal Horse Guards or any other unit during the First World War? If you are, click on the photograph below to learn more about the research service I offer. 5 October 1914: Embarked at Southampton, Headquarters Royal Horse Guards with one Squadron 1st Life Guards on SS Basil. 3 Squadrons Royal Horse Guards on Cardiganshire. 8 October 1914: Disembarked from Basil at Ostend and from Cardiganshire at Zeebrugge. 9 October 1914: Brigade concentrated at Bruges. Went into billets at nursery gardens at Sysseele. 10 October 1914: Went into billets at Chateau de Muncken, near Ruddervoorde. 12 October 1914: Marched to Boschmolens. 13 October 1914: Brigade marched 6 am to Ypres. Fired at a Taube monoplane, which subsequently came to the ground and was captured by the Army Service Corps. Left Ypres, marched on to Menin and returned to Boschmolens which we reached at midnight. 14 October 1914 – Marched 3 am to Ypres, the Duke of Roxburghe’s Troop were left flank guard to the Brigade and drove back a patrol of Uhlans killing one and wounding another. In Ypres a Taube monoplane flew low over the town and was brought down by the Naval armoured motors of the 7th Division. 18 October 1914- D Squadron advance guard to the Brigade on a reconnaissance towards Roulers. Came across enemy’s cyclists in considerable force. The ground was unpractical for cavalry and the enemy were occupying [the] road. Lieutenant and Quartermaster Harford dismounted a party and took the house, killing one German officer. One sergeant and nine men were killed, one man and 14 [?] being captured. Afterwards the house was fired as some Germans were let in the house and went on shooting. We suffered no casualties in men, four horses were wounded and one wagon damaged. The Corps Commander wished to express his appreciation of the following act of courage on the part of No.1183 Corporal of Horse E. Regan, Royal Horse Guards, and No.5271 Corporal of Horse G. Baker, 20th Hussars, attached Royal Horse Guards. On the 16th September 1917, a horse in ‘B’ Squadron, Royal Horse Guards, suddenly went mad. It broke loose and attacked several horses, biting 8 or 9 of them, and also attacked and bit one man. The above mentioned Non-commissioned Officers immediately tried to secure the horse. In spite of the fact that the animal made several violent attacks on them, they persevered, and got hold of the head-chain; and, eventually, after a long struggle, managed to hold the horse until a revolver was produced and the animal shot. By their action, Corporals of Horse Regan and Baker undoubtedly saved many men and horses from being attacked. A record of the above will be made in the Regimental Conduct Sheets of these N.C.Os. in accordance with paragraph (xiv), King’s Regulations.